Chennai, India, March 16, 2016 /ChinaNewswire.com/ - AccorHotels, the world’s leading hotel operator, announced the opening of ibis Chennai City Centre. The opening marked AccorHotels’ third hotel in Chennai city followed by ibis Chennai SIPCOT and Novotel Chennai SIPCOT in 2014. The hotel features 155 rooms and is centrally located on the city’s arterial and historic, Mount Road. Situated in the heart of Chennai city, the property is a short drive to Chennai airport and within close proximity to several shopping and entertainment attractions. Ibis Chennai City Centre offers modern, comfortable and well equipped ibis rooms and ‘Sweet Bed™' by ibis’ offering guests a quality sleeping experience. Guests can expect the highest level of service offered when staying at an ibis with a selection of food and beverage outlets to choose from with Spice IT, its signature multi-cuisine restaurant providing an all-day breakfast concept from 4:00 a.m. to 12:00 noon and a lounge and bar area, The Hub, offering a wide selection of refreshing beverages and light snacks. These adaptations are reflective of the hotel’s commitment to service quality and modernity in meeting the needs of business and leisure travellers. 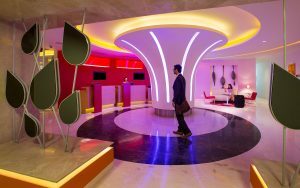 “The opening of the ibis Chennai City Centre is a strategic milestone for the ibis brand in India. Offering consistency, quality and affordability, the brand combines the ultimate comfort of modern and well-equipped rooms with the highest level of service for business and leisure travellers. The opening of ibis Chennai City strengthens our brand presence in Chennai and adds to the growing ibis network of 12 hotels in the region.” said Jean-Michel Cassé, Senior Vice President, Operations, AccorHotels India. J.B. Singh, President & CEO, InterGlobe Hotels, said, “Chennai has a growing demand for quality affordable rooms, and the ibis brand innovates constantly to illustrate its values of modernity, comfort and availability. The opening of ibis Chennai City Centre further consolidates the strategic partnership between AccorHotels and InterGlobe with the aim to enhance the ibis network growth in India”. ibis Chennai City Centre is located at Seethakathi Centre, 684-690 Anna Salai (Mount Road), Block No 6, Thousand Lights Chennai 600006, India, 20 km from the Chennai airport and 5 km from the Chennai Central Railway station. For more information, please visit www.accorhotels.com, email [email protected] or contact +91-44-71225588 for general enquiries or reservations.